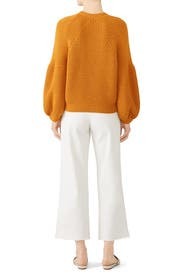 Balloon sleeves add voluminous charm to this cozy knit sweater by Mara Hoffman. Orange knit (100% Baby Alpaca). Sweater. Crew neckline. Long bell sleeves. 21" from shoulder to hemline. Imported. 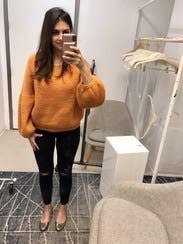 I am normally a small in sweaters but got a medium to avoid a cropped look. This sweater was so cozy and versatile. I would warn though to not rent this if you intend to wear with a coat. The sleeves are bell and thick and it's terribly uncomfortable to try to wear under a coat. So cute but sheds literally everywhere! 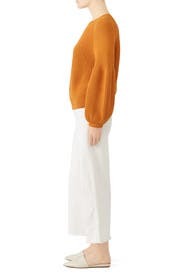 This sweater is so cute, feminine and easy to wear. My only issue was that it shed literally everywhere! If you wear this make sure you have a lint brush with you. I wore this at least a dozen times. The designer Mara Hoffman said to wear it as much as possible before washing it, so I'd like to think I was just following orders but the truth is it was so incredibly comfortable, soft, plush, and warm. I returned it reluctantly after keeping it for almost 2 months. I miss it already. Big sleeves are a great unexpected detail but I found it too hard to wear with a coat. Could wear w a cape but it's too cold here!!! Fun sweater, but not as nice as I expected. Only wore once. Sleeves were so large, hard to wear a jacket over. Loved this sweater. Heavy fabric, good golden color, warm. I didn't have an issue with the extra fabric fitting into my coat sleeves, but I can see how this can be annoying or not possible since there is a large rounded bell sleeve. Super heavy fabric. Extremely short. Showed my belly button. Not ideal. 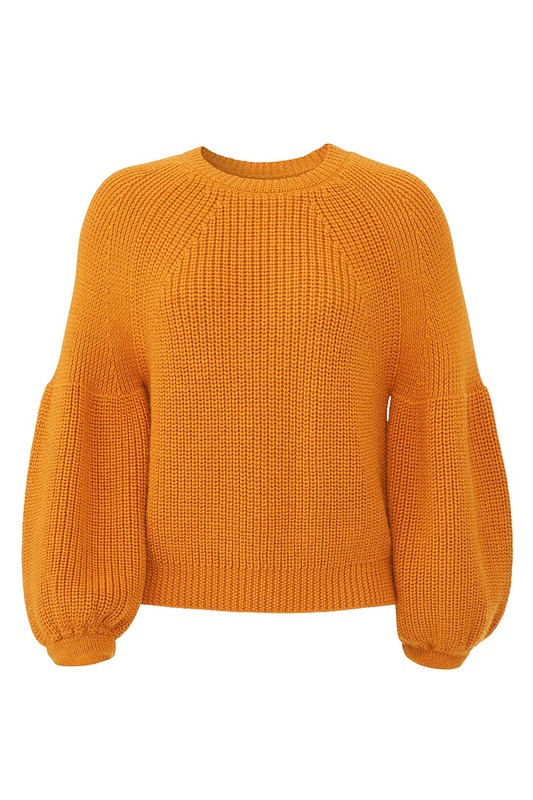 The most wonderful sweet potato soufflé of a sweater. I love it so much. Could not wear this enough, got compliments ever day and didn't want to send back. Although the sleeves are a bit bulky it was cozy and comfortable all day. Great color and shape. It was a little itchy and shorter than expected. This was cute but a little shorter at the waist than I expected. I'm 5'2. This sweater was very comfortable, hit at the right length. The sleeve shape added some style to an otherwise relaxed outfit. Paired it with the See by Chloe patchwork jeans, great combo! Only downside was that it shed a lot, there are mustard yellow wisps all over me now. 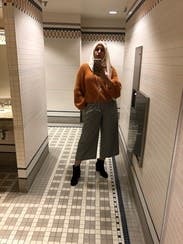 Wore this to happy hour and it's super oversized. Would have loved to wear a smaller size, but made this work once before sending back. The color is beautiful and so are the sleeves, but fabric was really scratchy also. Not a huge fan but did the trick. 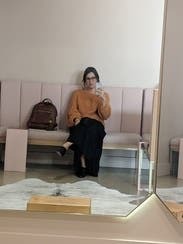 This sweater is cropped and very short. Simply put this is a beautiful sweater. The color is gorgeous and the thick yarn knit is stylish, warm, but breathable. The puffy sleeves make it feel like the sweater is giving you a hug. Looks good staying in with a glass of wine, a walk in the park or out to dinner. It's a keeper. 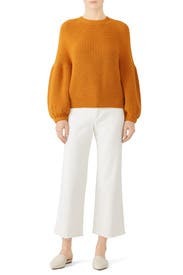 Grabbed this for a fun fall office look. Love the dramatic sleeves and saturated color! Cute! Runs true to size, maybe a touch big. I am usually between a M and S and got the S and it is fitting perfectly. 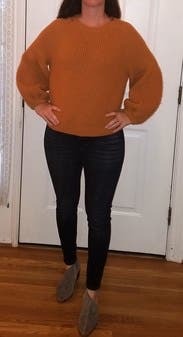 It is a fun twist on a normal every day sweater. The color is a really nice fall burnt orange. The pictures do not do this sweater justice. It's a heavy sweater, so works better on a colder day. Would be tough to wear to work if you sit inside at a desk all day as it would probably be too warm. It's a little shorter than I'd like, but manageable. It was quite itchy at first, but not unbearable. Love the color and am keeping it to wear again next weekend when the temperature drops a little more. Would definitely rent this again. One issue with it is the sleeves are so thick, I couldn't get any of my coats over them without squeezing my arms in. So, may be better on a cool fall day where you don't necessarily need a coat also. I love this cozy, thick Mara Hoffman sweater. The color was a tad darker than expected (somewhere between marigold and burnt orange), but it's a lovely fall/winter color. The puff sleeves can be a tough fit under certain coat/jacket arms, so just something to think about before renting for the winter! I received compliments on the color - a rich gold hue. Wanted to buy this sweater it's so soft! Bold statement sleeves and color. Loved everything about it. Feel, color and fit..so yummy! Sleeves were long and fun , sweater kept me warm and cozy. Wore it with pants and a dress. Very versatile. 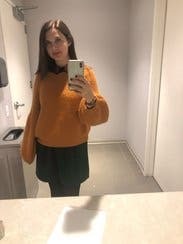 Loved this sweater and got a lot of compliments on it. Fit is super cute and the sleeves have nice detailing. Quality is tops and yarn is so soft. Paired it with high waisted jeans and white sneakers for a casual weekday/weekend look.